Almost all apartments are three side open. 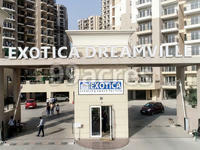 What is the location of Exotica Dreamville?The location of the project is Noida Extension, Noida. What are sizes of apartments in Exotica Dreamville? 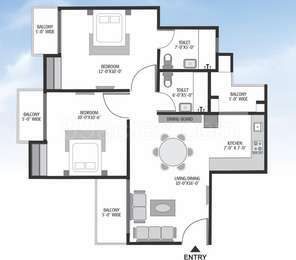 The apartment sizes in the project range from 920.0 sqft to 1705.0 sqft. 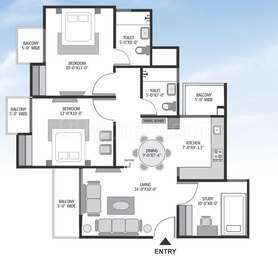 What is the area of 2 bhk in Exotica Dreamville? 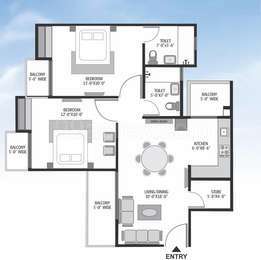 The size of a 2BHK unit in the project ranges from 920.0 sqft to 1235.0 sqft. What is the total area of Exotica Dreamville?The project spans across 10.0 Acres. How many units are available in Exotica Dreamville?The project has a total of 1704 units. RCC framed structure designed by highly experienced structural and approved by IIT Delhi. European style designer flush doors with hardwood frame and polish paint, with anodized aluminium hardware. Fire resistant wiring in P.V.C. concealed conduit. Provision for adequate light and power points as well as telephone and TV outlets with protective M.C.Bs. Internal: Plastered and painted in oil Bound Distemper or equivalent and one wall in master bedroom duly textured finish. External: Excellent weather proof finish of pleasing shades. Drawing, dining, bedrooms: Vitrified Tiles. Wooden flooring in master bedroom. Kitchen Ceramic Tiles, Balcony Ceramic Tiles. Provision for Hot and Cold water system with imported PPR, UPVC pipes and fittings. Glazed titles in pleasing colours on walls up to door level. European W.C. washbasin and cisterns in white shade. Tube light in drawing, dining, kitchen and bedrooms. Audio phone system with intercom facility for security. Underground Over head water tank for adequate water supply in each block and adequate bores in the entire complex. Exotica Housing and Infrastructures Pvt. Ltd. is a Delhi-based real estate developer with a strong presence across the national capital region, including Noida, Greater Noida and Ghaziabad. The builder group has introduced several landmark projects in these areas and has proved its mettle. The flawless reputation earned by the infrastructure company can be attributed to its quality construction and timely delivery. aterial and cutting-edge technology to set up the most exquisite residential developments. It has a large team of experienced specialists who are skilled and trained in estimating, scheduling, purchasing, cost engineering, safety, community relations and risk management. What is the current availability of apartments in Exotica Dreamville? What is the price for a 2BHK apartment here? Is this a good option to consider for end-use? Ms Bajaj, Exotica Dreamville is located in Sector-16C Noida Extension which is a developing residential node in Greater Noida. The property prices here are relatively economical than other sectors located close to Noida Expressway or developed regions like sector 50, 52, 62, etc. This is why homebuyers get attracted to the region. In the name of civic utilities you will find three local markets to take care of daily grocery needs, Gaur International School, Shopprix Mall, Fortis Hospital, etc. are located in proximity. A metro line is also in the pipeline which is expected to enhance the connectivity in the region as well as connects directly to key parts of Noida and National Capital Delhi. Currently, the status of public transport is not very robust, but you can easily get private cabs and autos at the main entrance of the society. Taruna, Exotica Dreamville is ready to move in project, and the price range of units here starts with Rs 35 lakh. The project also offers all modern amenities such as lifts, swimming pool, attached shopping centre, designated sports area, multipurpose hall, etc. In case, you are interested in making a purchase here, you may get in touch with a local property dealer or contact the owners of available properties directly through property portals like 99acres. What is the status of availability of senior citizen amenities in Exotica Dreamville? Is the builder reputed and I hope there are no issues with the project. Dear Ranjana, Exotica Dreamville is one of the popular projects in Noida Extension, and as of now, I have not heard anything negative about the project in terms of constructional issues such as seepage or leakage. However, the existing residents say the developer impose hidden charges at the time of sale as well as they have included power charges in maintenance so keep a check on your sale agreement before making any final decision. So, being an aware homebuyer, diligently inspect the society on your own at the time of site visit. Ms Bakshi, as far as I know, Exotica Dreamville offers senior citizen amenities such as yoga and meditation area, lifts for each block, garden, attached shopping centre, etc. If the availability of such facilities is a major concern for you, I would suggest to inspect the availability of amenities diligently and talk with the existing residents. You can even consider other options available in the same area such as Samrihi Grand Avenue, Mahagun Mywoods Ph 1, Stellar Jeevan, among others. In the name of healthcare facilities, there is a pharmacy shop, and the nearest hospital is Fortis Hospital which is 9 km away from the project.